Dean was born in East Hampton, New York, to Andrée Belden (née Maitland), an art appraiser, and Howard Brush Dean, Jr., an executive in the financial industry. He is the eldest of four brothers, including Jim Dean, Chair of Democracy for America, and Charles Dean, who was captured by the Pathet Lao and executed by the North Vietnamese while traveling through Southeast Asia in 1974. ^ Arak, Joel (December 13, 2003). "'Deanie-Babies' Believe in Howard". CBS News. ^ Strauss, Daniel; Griffiths, Brent (November 16, 2016). "Howard Dean: I'm running for DNC chair". Politico.com. Retrieved November 25, 2016. ^ "Clegg can win, says Howard Dean". March 31, 2010. Retrieved January 30, 2018. ^ Dean, Howard (June 26, 2016). "Two of two. Tories and Labour parties collapsing making way for the only coherent and sane party left in England, the Lib Dems". 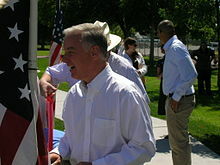 @GovHowardDean. Retrieved January 30, 2018. ^ CNN, Eric Bradner. "Howard Dean endorses Hillary Clinton, again - CNNPolitics". CNN. Retrieved February 7, 2019. ^ CNN, Tom Kludt. "Dean under fire for alleging Trump coke use". CNN. Retrieved February 7, 2019. ^ CNN, Gregory Wallace. "Dean apologizes for 'innuendo' in cocaine comments". CNN. Retrieved February 7, 2019. ^ The Canadian Press (December 18, 2018). "Tilray stock jumps on medical cannabis collaboration with pharmaceutical giant | CBC News". Canadian Broadcast Corporation. Retrieved January 8, 2019. This page was last edited on 4 April 2019, at 22:51 (UTC).